For the days of Lent, I was asked to make soups for a Lenten study group at my church at Wallingford Presbyterian Church. One soup was my chicken and vegetable soup (recipe to be posted later this week); the other soup needed to be vegetarian. I instantly thought of my puree of carrot pumpkin and ginger. It's easy to make, it's low-fat, vegan and amazingly creamy without a trace of cream, butter or any animal products. Since I wanted to boost the mouth-feel of the soup, I added in sweet potato. While I was tweaking my recipe, I decided to add a Fuji apple to the soup to add additional sweetness and to counter-balance the sharpness of the fresh ginger. The soup was so delicious, it needed very little salt and the puree became two products; soup for church and a bit was reserved to serve to Nate for his lunch. Right after I pureed the cooked carrots, onions, sweet potato and ginger, I spooned a bit out of the food processor before I added the cooking broth to thin the puree to make it a soup. Not only is this ideal to serve to a baby/toddler, but you could serve the thickened puree as a side dish for a fancy meal. Saute/sweat the onions, carrots and celery for about 8 minutes, until the onions turn translucent, the carrots start to release their water and the onions are starting to take on a golden color. Add in the minced ginger and sauté for 1 minute. Add in the sweet potato and apple and then pour in 4 cups of cold water; bring the mixture to a boil. Reduce heat; add the 1 teaspoon of salt; allow the mixture to cook at a gentle simmer for 25 to 30 minutes. Check the soup, when the carrots and sweet potato are fork tender but not falling completely apart turn the heat off. Working in small batches, puree the cooked vegetable mixture in a food processor or blender - CAREFULLY! The vegetables are still hot and will feel like napalm on your skin if it splashes on you! 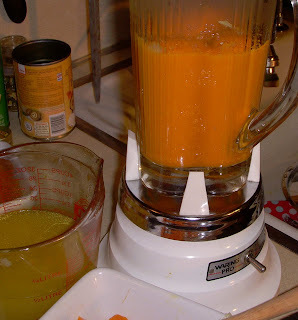 Use some of the reserved broth to thin the soup and to get the puree to move freely in the food processor or blender. Add each batch of puree back to the stock pot. Thin the soup with any additional reserved cooking liquid. Taste and adjust seasonings with salt and white pepper. Use white pepper, since the black would appear as annoying little specks, and this soup is all about the gorgeous orange color. Serve hot with chopped fresh parsley or dill as a garnish (optional). Makes about 6 cups of soup. mmmmmm, I am so making this! Gave up sweets and alcohol for lent, so this will be a great comfort to me. I would never have thought to put those ingredients together ... which is why I'm not The Bicycle Chef. A note to Denise, above--oh my, alcohol & sweets?! One sacrifice wasn't enough? Wish you the best with that Lenten resolution. Denise - Glad you like it. As for the sweetness, it's sweets that you can have without "cheating"! If you do not have a fuji apple, use a gala, or honey crisp. You want a firm, tart & sweet apple to add to the mix. Doreen - apples, carrots, sweet potatoes, they all work very well together. I make a carrot ginger and pumpkin soup too - the link is within this post. You can switch out the ginger and use curry in this recipe too! Thanks for the feedback!